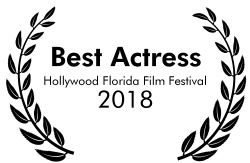 Nina has won Best Actress for her role as Leah in The Devil You Know. A spy/thriller short film, where triple agent Leah takes matters into her own hands when her trusted allies and mentor Abe (played by Mark Killeen) turn against her. Written and directed by Luce Newman Williams. Produced by HatchTanz Productions and Reel Motion Pictures 2017. Currently circling the festivals. Check back here for screening dates and online release.